This week I made two more new recipes that I saw on Facebook. The first were called Cowboy Cookies. I really don't know why they are called that, but they are basically Oatmeal Chocolate Chip with a hint of cinnamon. They are good and the recipe made about four dozen good sized cookies. I will make them again. In a separate bowl, blend the butter and sugars with an electric mixer until smooth, about 2 minutes. Add the eggs and continue to beat until fluffy, about 1-1/2 minutes. Blend in the vanilla extract. Using a wooden spoon, stir the dry mixture into the butter mixture one half at a time. Mix in the chocolate chips and walnuts. Refrigerate the dough for 1 to 2 hours. Heat the oven to 350 degrees. Line a large, preferably light-colored baking sheet with aluminum foil, then grease the foil. Using a scant 1/4 cup per cookie, shape the dough into balls and place them on the sheet about 2 inches apart. Flatten each ball. Bake the cookies on the center oven rack for 13 to 14 minutes, turning the sheet about halfway through. When they’re done, the cookies should be very lightly browned and still look moist. Don’t over bake them. Cool the cookies on the baking sheet for 2 to 3 minutes, then transfer them to a wire rack. Makes about 2 dozen cookies. Coconut Cowboy Cookies: 1 cup of flaked sweetened coconut, 2 cups of chocolate chips, and 1 cup of chopped walnuts. Cranberry White Chocolate Cowboy Cookies: 1 cup each of white chocolate chips and dried, sweetened cranberries. Peanut Butter Cowboy Cookies: 2 cups of peanut butter chips or 1 cup each of peanut butter chips and chocolate chips. The next recipe I made was called Unstuffed Cabbage Rolls. 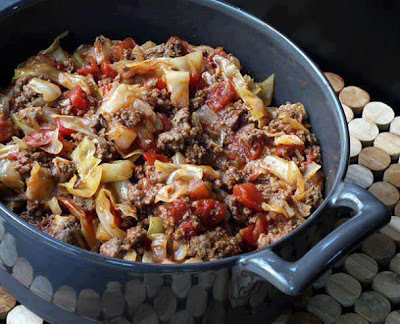 They are a casserole made with all the ingredients used in making Cabbage Rolls the regular way. I posted a recipe for them earlier (Cabbage Rolls for Dinner), but this is much easier and tasted much the same. I tried take a picture of my final product but it didn't look very appetizing. I didn't want to discourage anyone from trying this recipe. Because real cabbage rolls have rice in them, I added some cooked rice to this recipe also. Here is the photo from Facebook which looks much more appealing.